Yeeey, summer has officially started! That means: Berry season is on peeps! 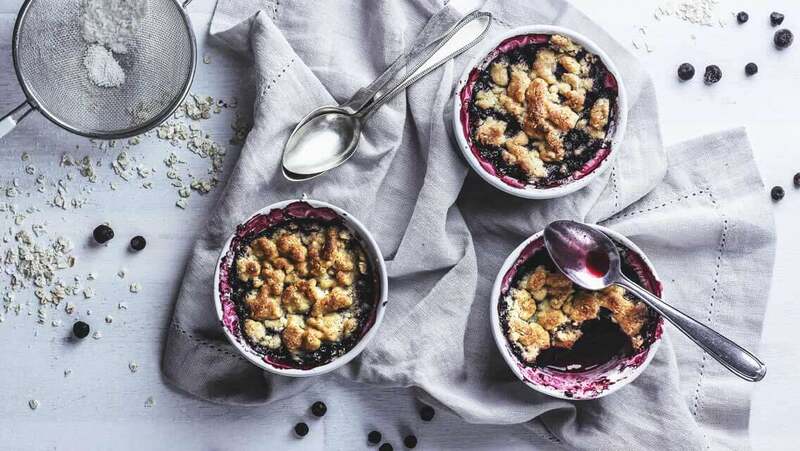 Blueberries, strawberries, currants – we love them all. The selection from June till August is especially wide. 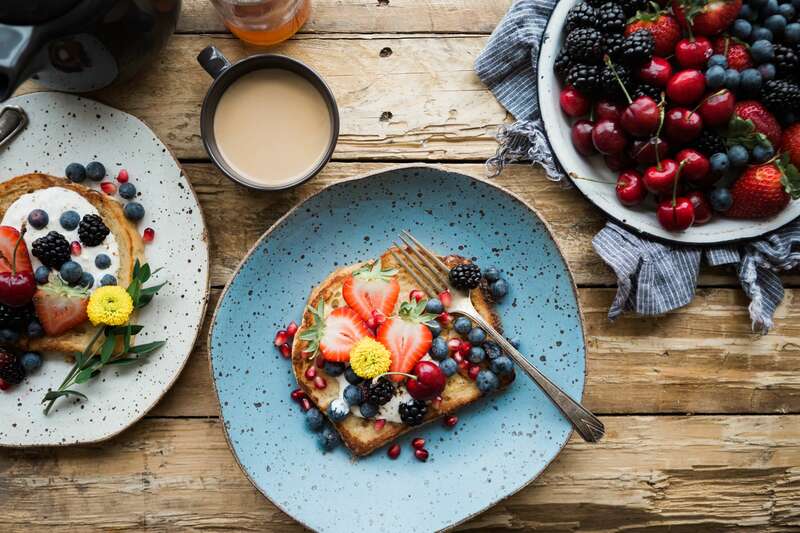 By the way, most of our berries are not even berries. From a botanic point of view, strawberries, raspberries & blackberries are collecting drupe. Crazy right? We could still eat them around the clock without any regrets. 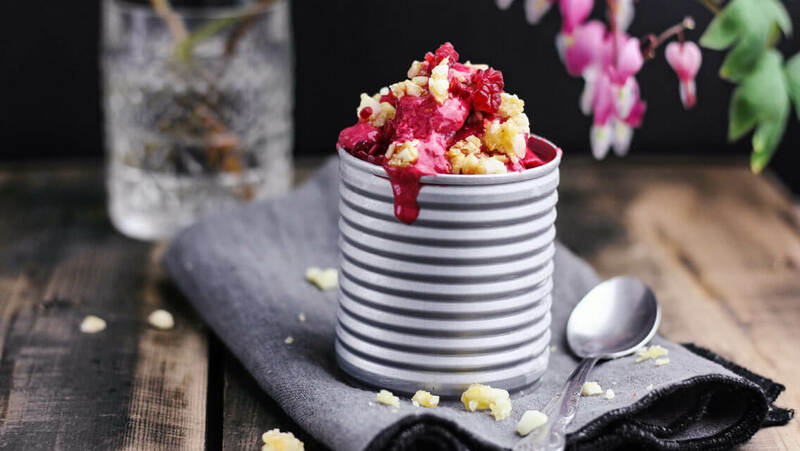 So here is a little insight into our most beloved berry recipes. 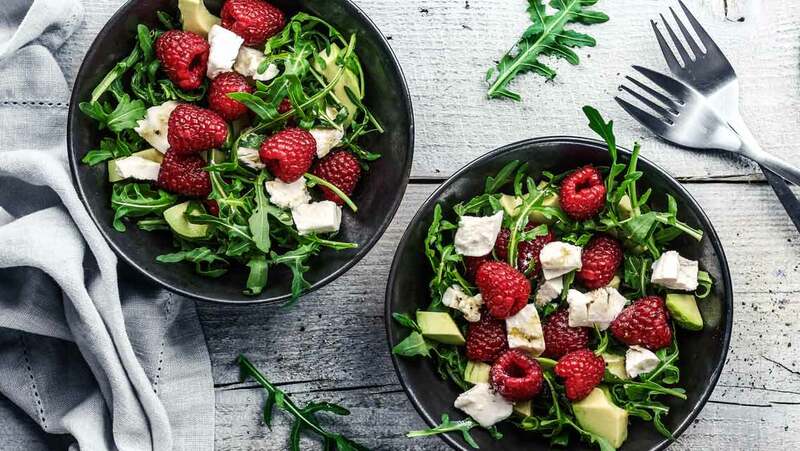 Sweet or salty, salad or dessert – we’re sure, every berry lover will find something. Wash raspberries and puree half of them. Sieve the raspberry puree to separate it from the seeds. Wash mint, shake dry, and pluck leaves. Wash lime and cut half into slices. Squeeze the juice out of the other half. Add lime juice, agave syrup, and mint to a glass and mash with a pestle or wooden spoon. 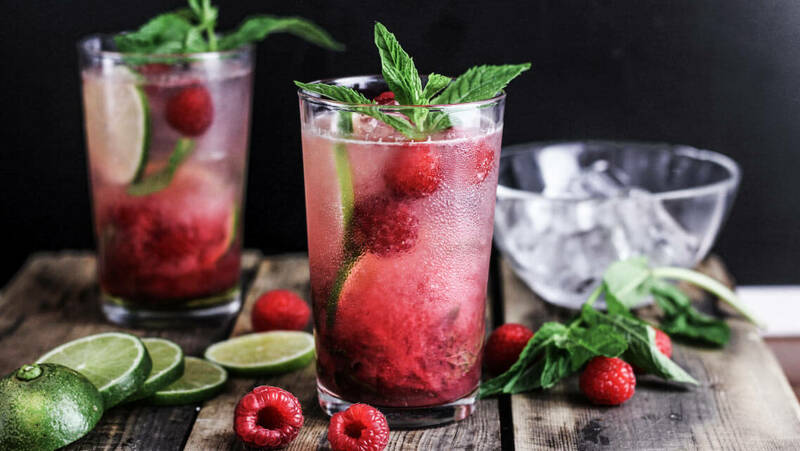 Add raspberry puree, raspberries, lime slices, ice, and water, and enjoy. Halve avocado, remove pit, peel, and cut into pieces. For the dressing, mix together olive oil, balsamic vinegar, salt, and pepper. Arrange everything on plates, add crumbled goat cheese and dressing, and serve. To make the dough, mix flour, oatmeal, half of sugar, and butter. Place dough in the fridge. Peel and finely dice apple. Put apples and blueberries in a baking dish and sprinkle with remaining sugar. Sprinkle with crumble and bake for about 25 min. Wash strawberries, clean, cut into pieces, and puree. Set a few strawberries aside for the salad. Crush mustard seeds, allspice, and cloves in a mortar or with a large knife. Peel and finely chop shallot. Heat oil in a pan, and sauté shallots for 2-3 minutes. Add the strawberry puree, tomato paste, vinegar, crushed spices, chili flakes, curry, and sugar; let simmer for about 10 min. Season with salt and pepper. In the meantime, wash and drain greens. Wash cucumber, halve, and cut into slices. Wash bell pepper, de-seed, and cut into strips. Peel red onion and cut into half-rings. Halve or quarter the remaining strawberries. Puree the strawberry ketchup with an immersion blender and allow to cool. 13 For the salad dressing, mix olive oil with apple cider vinegar, salt, and pepper. Season chicken with salt and pepper and fry in a grill pan or normal pan for about 3 min. per side until golden brown. Alternatively, the chicken can also be prepared on the grill. 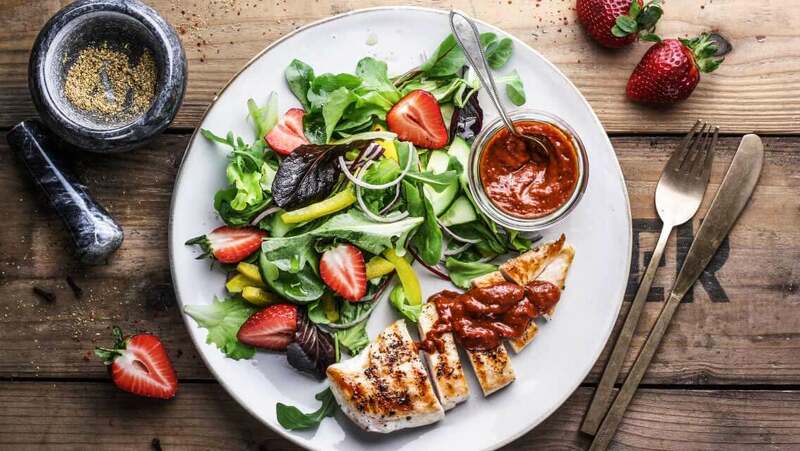 Arrange chicken and salad on plates and sprinkle the salad with dressing. Serve with strawberry-curry ketchup. Wash lime thoroughly, zest the peel, and squeeze the juice. Wash raspberries and mash the half with a fork. To make the dressing, mix lime juice and zest, raspberry vinegar, honey, and oil. Add salt and pepper. Set aside. Cut brie into triangles and set aside. Chop nuts very finely or crush in a food processor. Mix nuts with breadcrumbs and put on a plate. Whisk an egg in a bowl. Coat brie first in egg, and then toss in the breadcrumb-mixture. Do this twice to ensure that the cheese is completely coated. Heat oil in a pan and fry brie until golden brown. Remove and let drain on a paper towel. 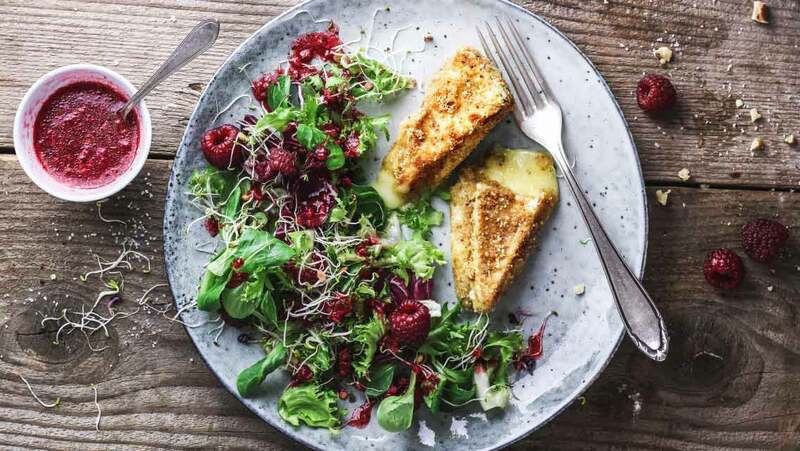 Serve the breaded brie with salad. Sprinkle sugar evenly and thinly in a dry pan. At medium heat, warm and let melt, but do not stir. When the sugar has melted, immediately add nuts and mix well to distribute caramel. Spread nuts on a sheet of wax paper and briefly allow to cool. Sprinkle frozen yogurt with macadamia nut brittle and enjoy. Posted in Rezepte and tagged Beeren, Beerensaison, Blaubeeren, Erdbeeren, gesund kochen, Himbeeren, kochen, Rezepte, Salat, Sommer, Sommeranfang, Sommerrezepte. Bookmark the permalink.